It’s the weekend that every fan of Biff Bam Pop! has been waiting for. 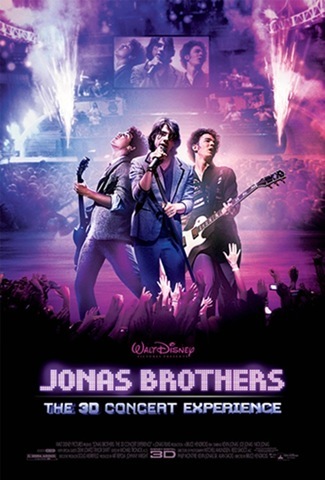 The Jonas Brothers: The 3-D Concert Experience finally arrives in theatres. I know you’re excited. I’m excited. Ok, I’m not excited at all, but this film is going to make some good coin. A year ago, the Hannah Montana//Miley Cyrus: Best of Both Worlds opened and shocked the industry. It’s opening was just over $31 million, which is good. The real surprise was that it was playing in less than 700 theatres. So it’s per theatre average was over $45,000. It was also an event movie, because it was only supposed to have a limited run. Sold out movie theatres made Disney extend the fun of the film. The Jonas Brothers has the same buzz going for it. This is to kids, as what Watchmen is to adults. It’s an event film. It will play in over 1,200 screens, runs approximately 1 hour and 16 minutes, meaning tons of show times throughout the day, and it will do better than Hannah Montana. I’m predicting that the Jonas Brothers rule at #1 and the film grosses $47 million. The other major new release is one that no one is excited for. Based on the popular video game of yesteryear – Street Fighter: The Legend of Chun Li opens in around 1,000 screens, which is small for a film like this. It’s directed by Andrzej Bartkowiak, who has not done anything that people really love [Doom is his most notable credit, and I don’t know many people who like that film]. The cast is B-List with Kristin Kreuk and Michael Clarke Duncan being the big names, and it shows the studio [20th Century Fox] doesn’t have much confidence in the picture. I’m sure the film will find a bigger audience on DVD. I’m predicting it opens outside the Top 5 at about $3.5 million. With not much else opening, there will not be much change in the Top 5. Madea Goes To Jail has been the number one movie throughout the week, followed by Slumdog Millionaire, which will get a bounce this weekend because of its 8 Oscar wins, and because Fox Searchlight is expanding its release. Taken is still doing well [still cannot believe this film is over $100 million domestically], and He’s Just Not That Into You and Coraline continue to impress with grosses of $71 million and $55 million respectively. I don’t know anyone who saw those films making that much money.